Rome: Salvatore "Toto" Riina, the Sicilian Mafia's most powerful boss of the 20th century who was convicted for ordering dozens of murders, died of natural causes early on Friday after almost a quarter of a century in jail. Riina, who turned 87 on Thursday, died in the prison ward of a hospital in Parma, the northern Italian city where he had been serving 26 life sentences for homicides committed between 1969 and 1992. His victims included the two magistrates who led the campaign to bring Mafia figures to justice. He had fallen into a coma after complications during surgery a few days ago, and his family had been given permission to be by his side on Thursday, the justice ministry said. Nicknamed "the Beast", Riina began his violent criminal career on the streets of Corleone after World War Two and became the Sicilian Mafia's boss of bosses when it reached its 20th century apex. Riina oversaw a flourishing economic period for organised crime group Cosa Nostra, or "Our Thing", when it was trafficking heroin to North America and pulling the levers of political power in Palermo and Rome. But due to Riina's savagery, hundreds of mobsters broke their code of silence in the 1980s and 1990s and testified against him, allowing magistrates Giovanni Falcone and Paolo Borsellino to uncover the long-hidden secrets of Cosa Nostra and prosecute its leaders for the crimes of its soldiers. Riina's January 1993 arrest, after more than 20 years as a fugitive, came just months after Falcone and Borsellino were blown up on his orders, and coincided with the tumultuous downfall of Italy's corrupt post-war political system. Since then, Riina has been held under high security with little access to his family in accordance with a law written to prevent bosses from commanding from prison. Refusing to cooperate with investigators until the end, Riina's secrets now will never be known. Given various nicknames over the years - Toto, Shorty, the Beast among them - Riina was 13-years-old when his father, a poor farmer, was blown up while trying to remove explosives from a bomb leftover from the war. When he was 19, he shot a man dead during a gang fight in Corleone and spent six years in prison, a rite of passage for a mafioso. When he returned to Corleone, he and his childhood friend Bernardo Provenzano, who would lead Cosa Nostra after Riina's arrest, fell under the sway of Luciano Leggio. Leggio took over the Corleone mafia with Riina and Provenzano at his side by killing the town’s wartime mafia boss, medical doctor Michele Navarra, in 1958. US author Mario Puzo would later name the main character in The Godfather after the town. In 1969, Riina and Provenzano led a hit squad against feared boss Michele "the Cobra" Cavataio, ambushing him inside an office in Palermo, killing the Cobra, another mafioso and two innocent bystanders. 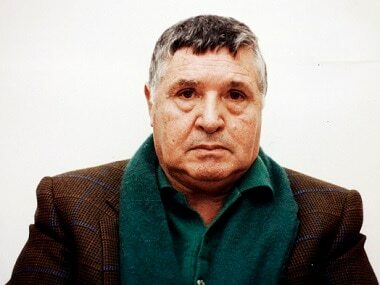 The so-called "Lazio Street Massacre" gave the Corleone clan a foothold in Sicily's capital and a post on Cosa Nostra’s governing body, the "Commission", and the arrest of Leggio in 1974 made Riina the acting boss of the Corleone crime family. The 1981 murder of mob boss Stefano Bontate signaled the beginning of a two-year killing spree known as "The Slaughter", in which Riina sought to annihilate his many rivals. Fearing for their lives and for those of their families, hundreds of mobsters broke their code of silence, or omerta, and cooperated with investigators. The turncoat testimony was a key component in Falcone and Borsellino’s landmark case against Cosa Nostra, which in January 1992 ended by holding mob bosses responsible for crimes committed by their underlings. Two months later, mafia assassins gunned down Salvo Lima, Prime Minister Giulio Andreotti's right-hand man in Sicily, sending a clear message about what Riina thought of the court ruling and Rome’s failure to stop it. In May of the same year, a massive bomb that blew apart a motorway near Palermo killed Falcone, his wife and three bodyguards. In July, Borsellino was blown up by another car bomb with his five bodyguards. Riina was arrested in Palermo six months after Borsellino’s murder and never broke his code of silence, leaving a shroud of mystery over suspected negotiations between Cosa Nostra and Rome said to have taken place after Falcone’s assassination. The law-enforcement crackdown that followed the 1992 bombings severely hobbled Cosa Nostra, whose presence in Sicily is still felt, but whose economic and political might has faded. Today, Calabria's Ndrangheta is considered by investigators to be Italy's most powerful organised crime group thanks to its role as the biggest European importer of South American cocaine. The mafia tradition has been carried forward by Riina's two sons, Giovanni and Giuseppe, who remained loyal to their father. Giovanni has been sentenced to life in prison for four murders, and Giuseppe spent several years in jail on mafia charges. Riina is also survived by two daughters, Maria Concetta and Lucia, and his wife Antonietta. His funeral is likely to be a private ceremony in Corleone, police said.